It is no secret that the reason adventure holidays in France are so popular is the ‘complete package’ that it offers. A self contained complex with accommodation blocks is designed to give each school their own space. With its large dining room, and plentiful outside areas for students to let off steam; it’s perfect for school groups looking for ideal school adventure trips. Land based activities are also situated on site and the helpful instructors make each session fun and action packed. 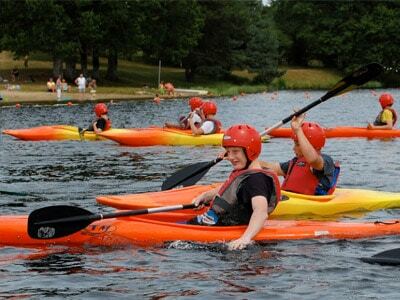 The activ4 water sports programme takes place on nearby lakes. The close proximity of fantastic lakes is a great draw for our groups. You can also make the most of the summer term with a Watersports trip on the Mediterranean Sea. Stay in our Premier Resort of Platja D’ Aro, Spain with its fabulous beaches and handy waterpark. The hidden beauty of our adventure centres in France provides the perfect launching pad for your next France School Adventure Trip. Always a favourite with school groups looking to enjoy the great outdoors the dynamic design & landscape at our watersports centres allows groups to combine a whole host of adventure and watersports activities in the same location. Going further afield to experience the nearby Dordogne is a common inclusion in our tours. What isn’t there to do there? From start to finish you will have an itinerary crammed full to the brim. It’s up to you what to include & we will help suggest the best options for your group. How about watersports including Sailing, Kayaking or Paddle-boarding on the stunning lake followed by a land-based activity such as orienteering or rifle shooting, fencing or archery? Excellent, fully qualified tutors will provide all the hands on experience to bring out the best in your group and make sure that you achieve an action packed and unforgettable experience. Encouraging teams to work together and push their boundaries by maximising confidence and abilities, by the end of your stay or whatever your aims of the trip may be, we will ensure you get the most out of it & bring out the best in your kids. Your coach will depart from school and travel to Dover where you will cross the channel to Calais. Your journey continues overnight to your destination in the heart of the scenic Limousin region of central France. Make sure you take your favourite DVDs with you to enjoy throughout the journey. On arrival at one of our adventure centres you will be met by the owners who will assist you throughout your stay. All our adventure centres are purpose built. It is a very popular choice for school groups who return year after year. There is a wide range of both water and land based adventure activities meaning there is never a dull moment throughout this action packed tour. You will enjoy continental breakfasts and 3 course dinners that will be taken in the restaurant and you will receive packed lunches as you will be out and about enjoying your activity sessions. Once unpacked you will take a leisurely walk to the beautiful lake for a swim and a game of volleyball on the beach. As with all Activ4 programmes, evening entertainments will be planned for your group and hosted by the fantastic resort staff, you can round off your first night with team games. Your group will start each day with breakfast before heading out to the nearby lake of Sechemailles for the day’s activities which can include Kayaking, Canoeing, Sailing, and Boarding. Your activity sessions will begin with a full safety briefing from the instructors. Groups will then be split and activities really get under way. The afternoon will be taken up by these activity sessions finishing in time for everyone to return to camp. Round off your day with a Treasure Hunt! Start today with land activities which can include Mountain Biking, Orienteering, and Rambo Ramble (a muddy back to nature experience!). The centre is surrounded by rich mixed forest ideal for Orienteering and Rambo Ramble. The local area has a maze of small tracks which is ideal for Mountain Biking with the bonus of tremendous views. Return to camp where this evening’s entertainment will be a quiz night hosted by the quiz master! Back out for more action to pick up where you left off with the activities. The students will be taking part in the onsite activities they have not yet experienced with some Target Sports which can include rifle shooting, archery, fencing, indoor climbing as well as team building challenges. After an eventful day you will head back to camp as you all gather together for a disco night, perfect way to end your tour!